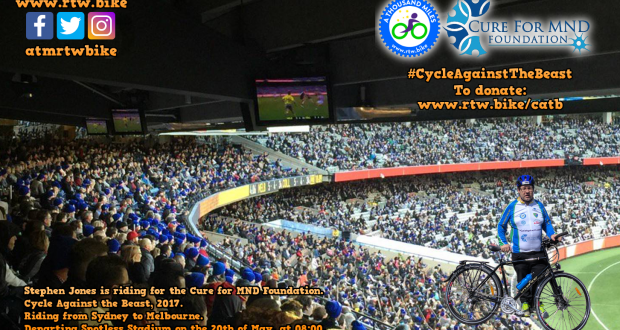 On the 20th of May, 2017, I will be setting off on my first charity bicycle ride for the Cure for MND Foundation (now publicly known as FightMND). 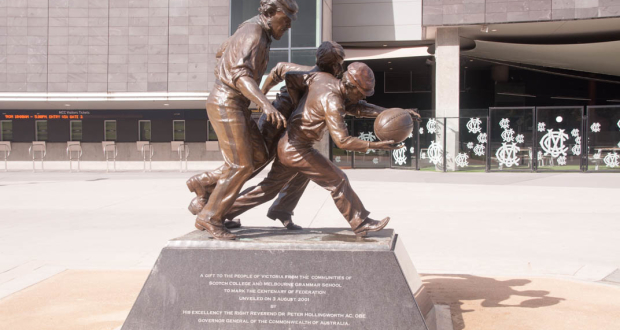 I will be leaving from Spotless Stadium, at first light, and intend to arrive in Melbourne, at the Melbourne Cricket Ground (MCG), on Saturday the 10th of June, in plenty of time for the 12th of June. This is the day of Big Freeze 3, which is a major fundraiser for the foundation. MND stands for Motor Neurone Disease. It is also known as Amyotrophic Lateral Sclerosis (ALS) or Lou Gehrig’s Disease. There is currently no cure. The Cure for MND Foundation was set up to raise the awareness of the disease, but also to provide funding for research and clinical trials. They also provide care to patients by way of arranging access to equipment necessary to maintain independent lives and a level of dignity. The route I’ve chosen is through to Picton. From there, I will shadow the Hume Highway until past Yass, before cutting across to the Olympic Way, and then make my way to Corowa, Shepparton, Ballarat and Geelong, before the final push to the MCG. An approximate route profile is shown below. As I’m giving myself plenty of time to do the ride, I may not post an itinerary. A new fundraising page has now been set up! You can donate by following this link. If you’re an Australian taxpayer, donations of $2, or more, are also tax deductible. Each day, at least two Australians are diagnosed with MND. And, each day, at least two Australians die from it. There is no cure. It is a Beast of a disease. Without your help, MND will keep on killing. 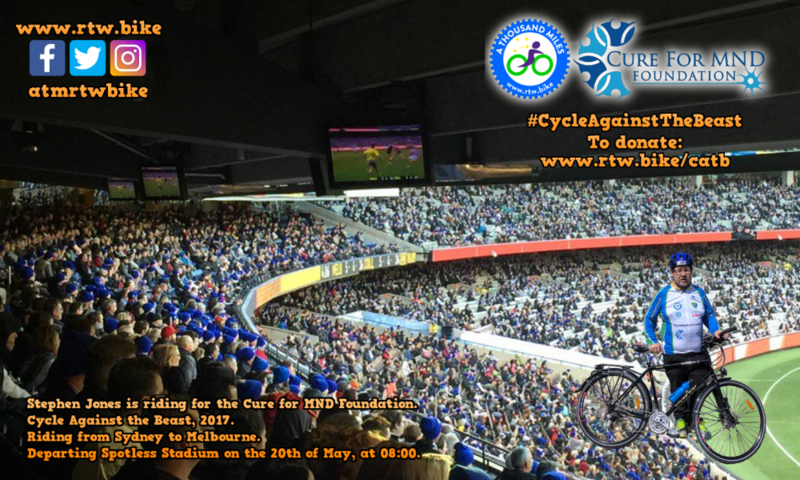 Previous PostFour Years to Go!Next Post 25th April, 2017 (Anzac Day) – Less than four weeks to go until Cycle Against the Beast!